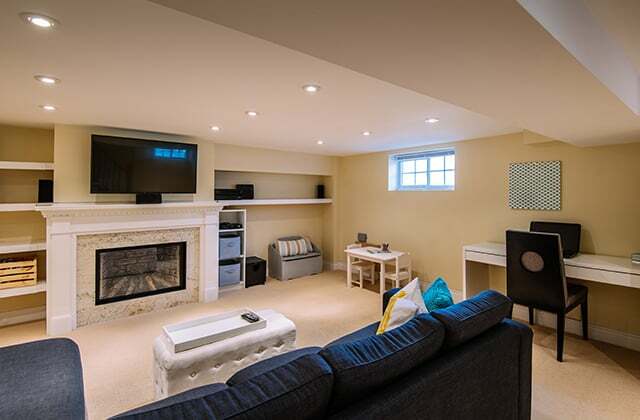 Basements are no longer the dark, humid caves they used to be! They have become part of our living space in their own right, where the entire family can get together. What’s more, finishing the basement is a good investment as it adds to the value of your home. Stick to the goal of creating a warm, welcoming space and make every square foot count. Comfortable furniture, pleasing colours and decorative accents are the hallmarks of a pleasant, welcoming room. Certain decisions have to be made at this point to ensure you fulfill your family’s needs according to everyone’s respective activities. An additional concern for basement layouts is the space. Is your basement one big empty room? Does it have smaller dividing room? Do you want it to be one big room, or is it better with smaller spaces for different functions? Would it be easy to add a bathroom or half bath? Space is often limited, and can also be dark, so think big – go for open spaces. You could opt for glass doors that let the light through. If you find there is any dampness, you must take steps to eliminate it by means of good aeration and heating. Think about extra storage and about how you can maximize the basement’s layout to organize the space. Plan for additional storage space if necessary. Though its often tempting to design a space for the here and now, do consider the future. For instance, a playroom may be necessary at your particular stage of life, but design it in such a way that it can easily be transformed into, say a movie room, a few shorts years down the road. You could decide to give more than one function to a room by creating a multipurpose space that can be converted when needed. For example, a family room or an office can easily become a guest bedroom with a sofa-bed, floor storage and closets to hang clothing. An extra TV room (one for the kids for example): Sometimes it is nice to have a TV that the kids can control to play their favorite shows and video games. Not only will the noise level decrease in the rest of the home, but it gives older kids a space they feel is their own—to relax, entertain friends and just hang out. Movie theatre: To create a home theatre, bear in mind that you must allow sufficient distance between the armchairs and the screen. Lighting is less important here, but comfortable seating is essential. You may also want to consider soundproofing the room. Guest bedroom: If you often entertain guests, a private suite in the basement is ideal. Your guests will enjoy having their own space to retreat to without feeling like they are in the middle of a busy household. Home gym: You’ll need enough room for a cardio machine, a few dumbbells, an exercise mat and other workout items. Adorn the walls with full-length mirrors and you’ll forget you aren’t at the local gym! Office: Do you work from home or simply need a place to pay the bills, surf the Internet and file household paperwork? The basement is a great place to set up an office. Game room: Perhaps your family could benefit from a game room to occupy kids (and adults!) during those seemingly never-ending winter months. Complete the room with a pool table, foosball, card table and more. Craft room: Do you enjoy crafting, sewing or scrapbooking? Set up shop (that you won’t need to tear down every night!) with all of the essentials. Playroom: Dress it up with murals, chalkboards, whimsical items and maybe even a small slide. Your children will have the space to get some energy out—especially when the weather doesn’t allow for outside play. Library: A few bookshelves coupled with comfortable leather recliners and you’ll be sneaking off to the library every chance you get. In a reading room, proper lighting is paramount. It should be of good quality and sufficient to read there at any time of day. For maximum effect, you could install floor-to-ceiling bookshelves on practically every wall. Wine cellar: For the ultimate look, arrange wooden boxes obtained from your wine merchant and an empty barrel to use as a wine-tasting counter. Remember that good aeration, well-controlled humidity levels and subdued lighting are all essential for aging wine successfully. Workshop: A work bench, a set of tools, and other necessities will quickly turn a just-sitting-there-space into a functional workshop. Organized storage room: When properly planned and well designed, a basement can accommodate many storage needs. Take the time to evaluate your needs. Laundry room: Think about placing this next to the water heater and plumbing to reduce your plumbing bill considerably. And if you feel like making your life a little easier, you could think about installing a laundry chute leading into the basement. Bar: If you often entertain guests, consider setting up a bar in the basement for you to retreat to. 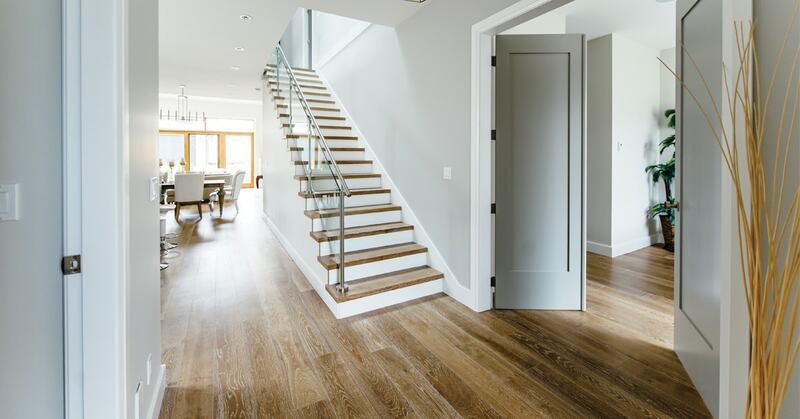 Your basement’s characteristics will not only influence architectural decisions but they are also a key element when it comes to choosing flooring. Factors such as increased humidity, cooler temperatures compared to the rest of the house and limited light all need to be taken into consideration. It would be wise to lay a subfloor over concrete. 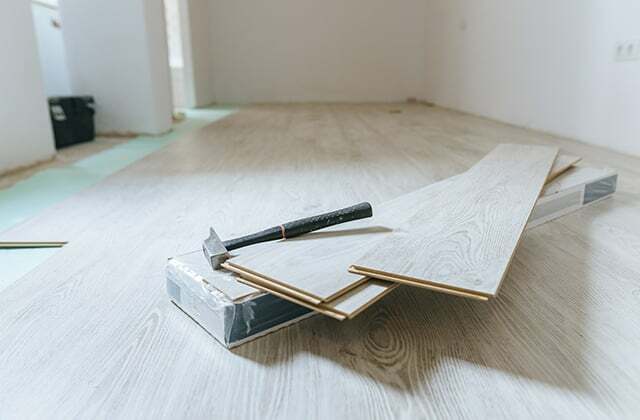 There are new, easy-to-install materials on the market that are specially designed to stop damp rising through a concrete floor slab. Vinyl: Easy to maintain and available in a wide range of patterns. Vinyl lasts about seven years and is good for guest rooms, offices and playrooms. It can be laid directly onto concrete, but is difficult to remove when it comes time to replace it. A washable vinyl covering is a smart choice if you have children. Linoleum: Very damp-resistant and fire-resistant, linoleum is suitable for use in most rooms, including high-traffic areas, such as playrooms and family rooms. Hard wood: Timeless, chic and elegant, hard wood floors add to a home’s value and the finished effect looks fabulous. Consider choosing new exotic, eco-friendly woods like bamboo and bubinga. Laminate: Nothing can withstand wear and tear like laminate; it also has the same aesthetic appeal and warmth as real wood. It’s easy to install – simply follow the manufacturer’s instructions – and this makes it especially suited to basement use. Ceramic: Versatile and low-maintenance, ceramic tiles can be laid in a variety of ways, with artistically-arranged inserts. Because ceramic is colder to walk on, you might find it less comfortable; it may be better suited to bathrooms, offices and laundry rooms. For more information on floor coverings, consult our buying guide. There is an additional design element in basements that you don’t often think of when designing other rooms of the home: ceilings. If you think a suspended ceiling gives off too much of a "basement" feel, you could go for ceiling tiles. 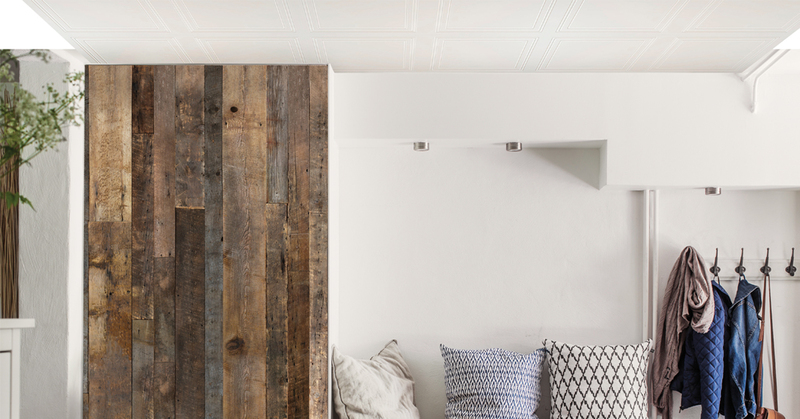 Although more expensive, this type of ceiling offers a polished and aesthetically-pleasing look. It is just as versatile as suspended ceilings when you need to carry out small plumbing and electrical jobs. Whatever type of ceiling you choose, its height will be determined by the lowest point of any piping, wiring or other electrical installation. Since you may be sharing the basement with occasional overnight guests, decorate with a pull-out sofa rather than a conventional one. Build in some extra drawers or closed cabinets for guests to store their personal items while visiting. Provide somewhere for them to hang their clothes. Stools with storage inside or armoires that complement your decorative look are both attractive and useful for keeping guest bedding and towels. Purchase furniture that can easily be adapted from room to room. For instance, a TV stand could eventually be used as a dresser if you ever decided to convert the room into a guest suite. Always opt for furniture pieces with storage—you can always use more places to store things! Lighting plays a major role in home decoration and can make all the difference between a room being functional versus it being really beautiful. It should therefore be considered a priority, especially in the basement, where light is often in shorter supply than in the rest of the house. 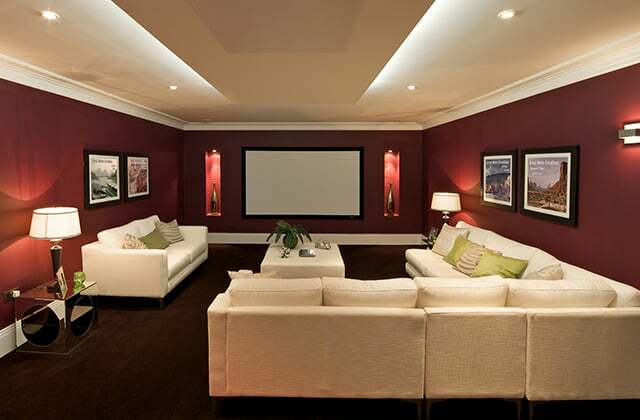 Recessed ceiling lights are ideal as a general light source for the basement. Adding dimmer switches will enable you to adjust the light intensity as you need it, altering the mood of the room. Swivel spotlights or a combination of different types of lights will offer more versatility. 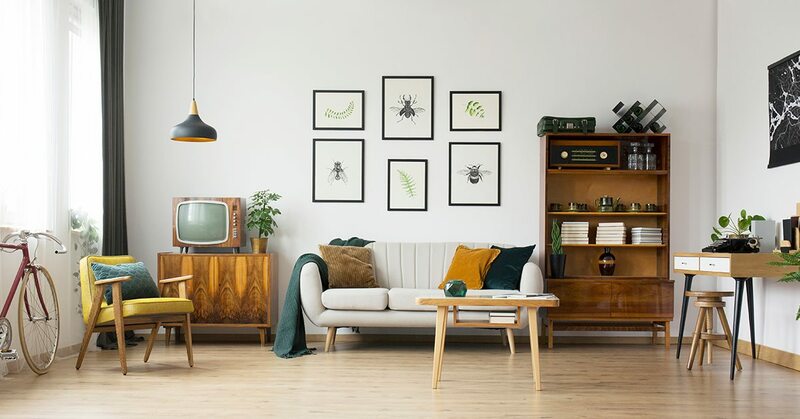 Floor lamps or table lamps are great for reading or lighting a game table, while wall sconces will highlight interesting features as well as make the room feel cozier in the evening. One trick to create more natural light is to use mirrors They make a room look bigger and increase brightness; they also highlight interesting details. As with any room in the home, the more lighting sources the better—this way you’ll be well equipped for any situation that comes along. Consider adding a deep freezer to accommodate extra meats and other foods, allowing you to save money by purchasing items in bulk. Space under the stairs is often wasted. 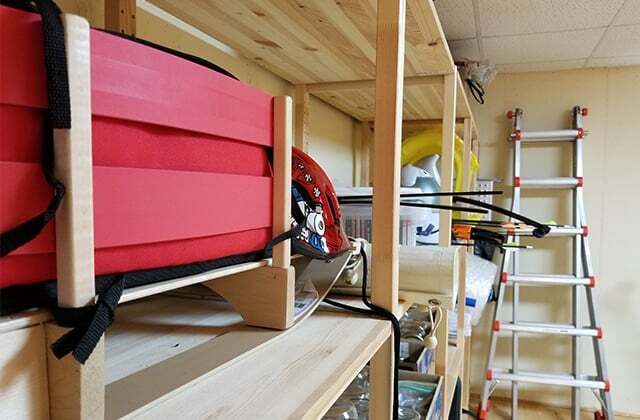 Why not fit it out as a place to store cleaning products or firewood? Install an adequate storage system in one corner of the basement to store items that are not used frequently—winter sporting gear, holiday decorations and more. A small set of shelving units can act as a backup pantry. Ensure you never run out of anything again with a well-organized stockpile in the basement. Basements are often plagued with visible structural elements—beams, pipes, columns and more. It is vital that you do your best to disguise any bad points. If beams and pipes remain visible, they can be painted the same colour as the ceiling. Install built-ins around certain elements. For instance, if there is a support column in the middle of the room, perhaps you can construct a seating arrangement or high-top table around it. Or, have a faux painter make it look like a stone column.